​Between Strathyre and Killin and to the north of Callander lies a bike trail that despite being short, ranks among the best rides I've done. A walk along here a few years ago actually prompted me to take up cycling again after a ten year absence due to busy roads though it was only recently that I finally got to ride it. As well as being a section of the Rob Roy Way, this trail is part of a much longer National Cycle Network route linking Glasgow and Inverness with this ride being from Strathyre up over the viaducts to the Glen Ogle car park on the forested ridge just south of Killin. As with my West Highland Way outing I had to do this in both directions but I'm not complaining there. The rain was just about holding off as I left Strathyre; just after the bridge a bike track led northwards beside the river and soon brought me to Balquhidder on a good trail that is at first flat then undulating as it heads through woodlands. 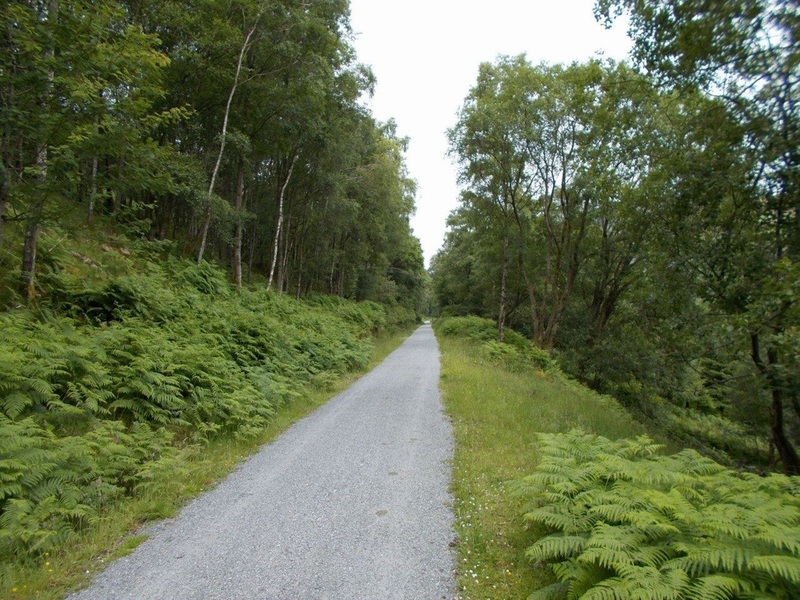 There's a short section beside the A84 but you're not riding on the road and for the most part it's a quiet trail. 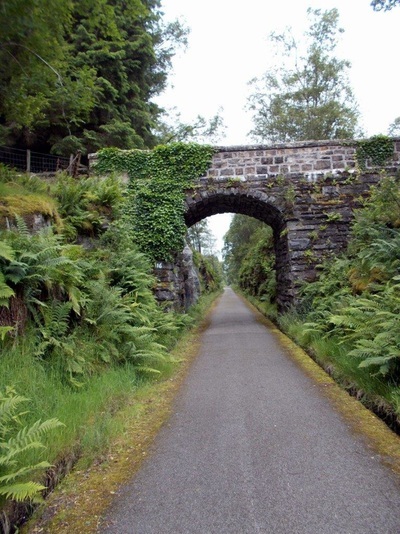 As Lochearnhead is approached the route starts becoming more interesting and there's a dip down to the lowest point of the day at about 120m/400ft where the river flowing into Loch Earn is crossed on a viaduct then an iron bridge above thick woodland. 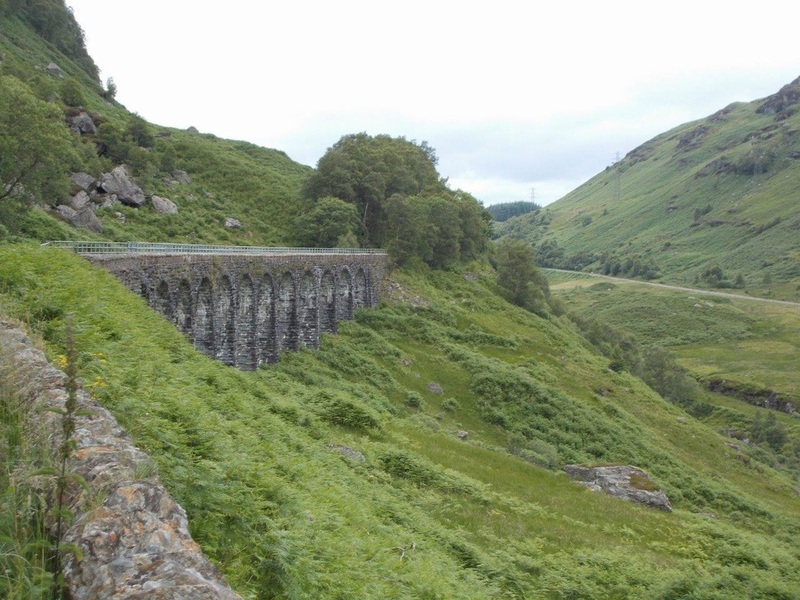 After this is a steep climb of almost 100 metres by a switchback track to rejoin the old railway track and head up Glen Ogle - the most spectacular section - at an easy gradient. 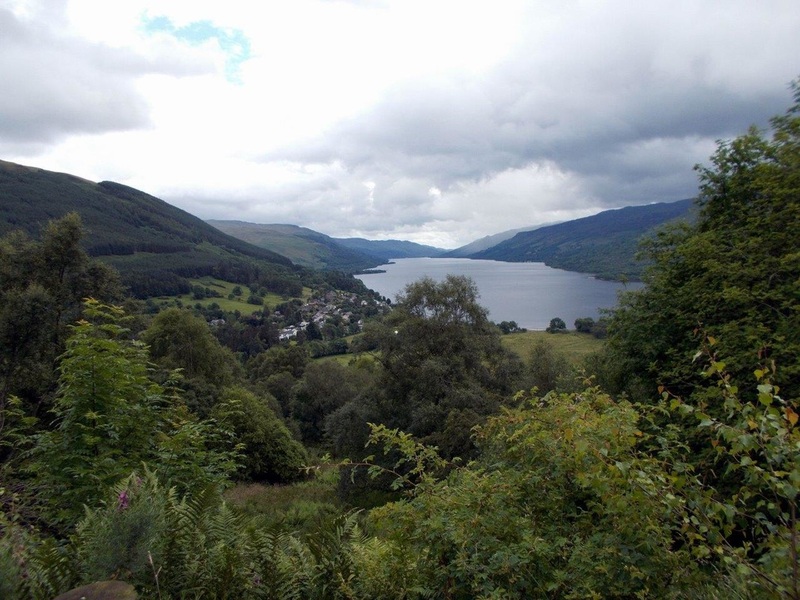 ​At first stunning views of Loch Earn and the surrounding hills are revealed through the trees stretching away eastwards then an increasingly wild Glen Ogle is followed with the road far below as the pastoral country around Locearnhead is left. The highlights of the route are the original railway viaducts which are crossed above boulder strewn slopes while mossy streams fall from the mountainside up to the left. Despite the rugged terrain and often precipitous drops to the valley, the path remains easy all the way and is suitable for kids and road bikes. The sides too are well fenced against cyclists going over the edge! Soon the trail enters more of a gully in deep woodland (an old railway cutting blasted through the rock) and heads under an old bridge before the road is reached again. Just off to the left and seen through the trees is the water of Lochan Lairig Cheile then the road is crossed. The highest point of the route (about 315m/1030ft) is reached on the short section of path between here and the car park which was as far as I went due to forecast storms. This ride was 14.5km/9 miles so far and it's another 6km/4 miles on to Killin but you'll have the hill to ride back up again if returning to Strathyre but on balance Killin and the Falls of Dochart are well worth it. As for me all that remained was an effortless mainly downhill ride to Lochearnhead and the easy trail to Strathyre. I'll definitely come back and do a longer section of this as after Killin the route follows the full length of Loch Tay past the mighty Ben Lawers - pure joy!